This point cutting round over bit has a roundover radius of 7/32" and a total cutting depth of 15/32". The cutting diameter is 1/2" and the tip is sharpened to an 1/16" point. The shank is 1/2" in diameter and the blades are C3 micro-grain premium carbide. 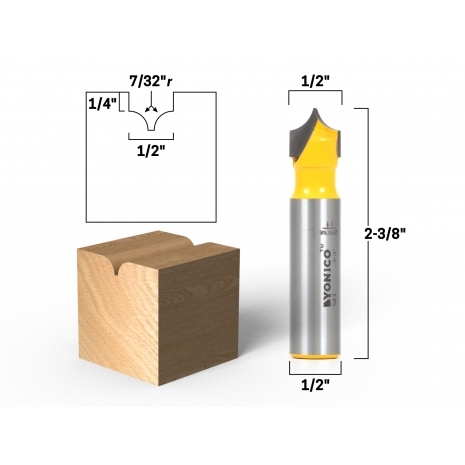 Point cutting roundover bits allow you to place a roundover profile or groove in just about any location on your workpiece. These are great for MDF cabinet doors and for beading detail on columns and moldings. The blade is a single piece of C3 micro-grain tungsten carbide which is sharpened on either side for true plunge and CNC capabilities.